Jus' holdin' a marble statue's head. NBD. 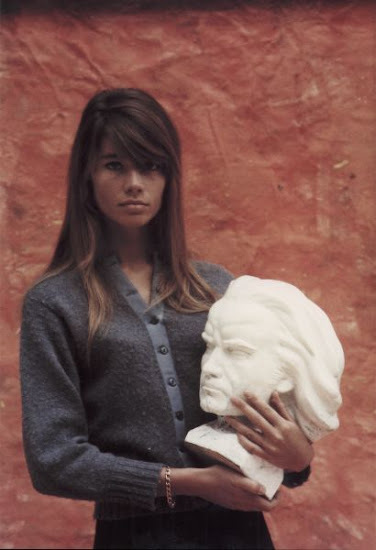 Everyone has a favorite icon, and mine will always be Miss Françoise Hardy. What a BA. I've written a couple of other posts about her, if you are still interested: here and here. I have started blogging at blogspot again. Have missed your blog ! I love her voice and her sound. I love this post! she's just so bronzed and slim and the epitome of french lithe girlishness. sigh. she's been my hair inspiration for oh, about 10 years now and i doubt it will ever end, she has the most sublime head of hair! Who can resist a girl singing in french??? i just love her hair it is stunning!! Yesss love her. Off to check out your other posts on her.